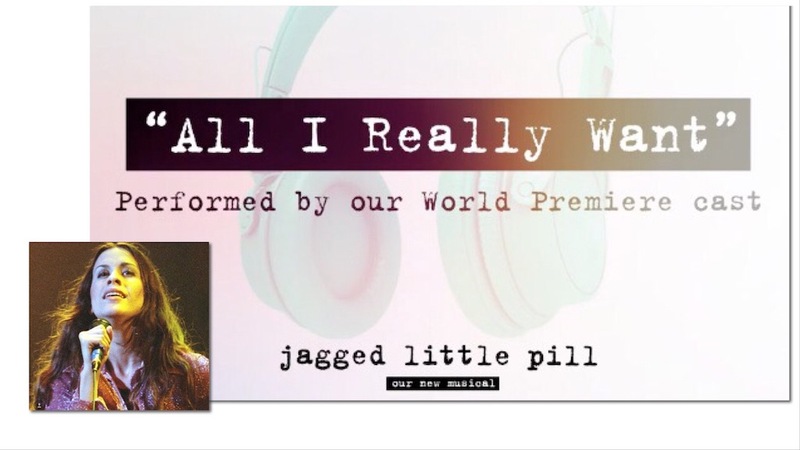 The musical inspired by Alanis Morissette’s album of the same name just released the track “All I Really Want.” “Jagged Little Pill” had a limited run at the American Repertory Theater in Cambridge, Massachusetts from May to July last year. It was recently announced that the production will be transferring to Broadway this 2019. With lyrics by Alanis Morissette, music by Morissette and Glen Ballard, book by Diablo Cody, and direction by Diane Paulus (Waitress, Pippin), “Jagged Little Pill” is about a family grappling with uncomfortable truths about urgent issues affecting our world today. It’s inspired by the themes and emotions of Morissette’s album, which includes hits such as “Ironic,” “You Oughta Know,” and “Hand In My Pocket.” The creative team also includes Tom Kitt (music supervision, orchestrations, and arrangements), Michael Farrell and Guy Sigsworth (additional music), and Sidi Larbi Cherkaoui (choreography). The track is performed by the American Repertory Theater cast, which includes Elizabeth Stanley (Mary Jane Healy), Derek Klena (Nick Healy), Celia Gooding (Frankie Healy), Sean Allan Krill (Steve Healy), and Lauren Patten (Jo). The ensemble also includes Jane Bruce, John Cardoza, Antonio Cipriano, Kathryn Gallagher, Laurel Harris, Logan Hart, Max Kumangai, Soph Menas, Sean Montgomery, Nora Schell, Whitney Sprayberry, Kei Tsuruharatani, and Ebony Williams. The album, which was released in 1995, has sold more than 33 million copies to date and also earned Morissette 5 Grammy Awards, including Album of the Year. You can listen to the track in the video below! Previous WATCH: "Frozen 2" Teaser Trailer Released!